Encrypt and digitally sign your files, emails, and instant messages. Create secure message text for use in any application, archive files securely, and securely delete your files beyond US Government DOD standards. FileAssurity Open PGP Security brings you the advantages of using the world's most recognized encryption standard: OpenPGP - without the complexities associated with such products. Full PGP and PKI interoperability - share information securely with PGP, OpenPGP and PKI users. Send and receive PGP files without the complexity and cost of using PGP. This simple to use pgp file and email encryption product ensures you will be communicating securely with others in less than a couple of minutes. By encrypting files you ensure that only those people you choose can view them. Files can be digitally signed to prevent them being altered without your knowledge and to allow others to verify that you created them. This feature can also help protect your organization from viruses and other email threats. 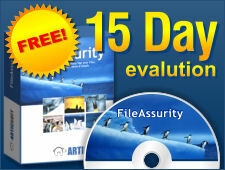 Securely deleting files ensures others cannot recover them to view your private information. At a third of the cost of PGP, more features, and simpler to use, you can see why SC Magazine recommends FileAssurity Open PGP Security. See FileAssurity Open PGP Security vs PGP Desktop comparison. "FileAssurity OpenPGP Security is a step in the right direction putting simplified PKI into the hands of end users. Impressively it can import certificates of nearly all formats, ranging from .pgp to .p12. It generates, imports and manages both PGP and X.509 certificates through a single user interface. A competent PGP file encryption system that supports PKI in an open and easy-to-use manner"
Encrypting files is a simple matter of right-clicking on the files you want to protect in Windows File Explorer. Information can be protected for single users, multiple users, or groups. For those organizations that prevent users from right-clicking on the desktop, FileAssurity Open PGP Security has it's own GUI that replaces Windows Explorer for encrypting, decrypting, digital signing, verifying and securely deleting files.